I don’t see a lot of commercials, but since I have been glued to Olympic coverage from 7-11 pm for the last fortnight, I have seen my share of Old Navy dark wash denim and Chevy commercials. 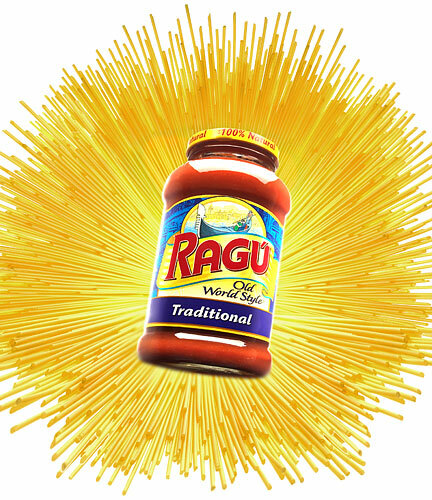 What I didn’t see coming was the most disturbing thing I have seen in a long time, the Ragu commercial. Yes, that’s right, as in pasta sauce. It was like a mirage. I almost wonder if I dreamed it, but it was quickly confirmed by the mix of horror and chagrin mirrored on Eric’s face. It must have been between 8-9 pm because my 10-year-old was subjected to it too. If you didn’t catch it, count your lucky stars. Let me assure you, that’s not a bell that can be un-rung. Suffice it to say the storyline involves a boy walking in on his parent in a compromising moment and a family pasta dinner to make it all better. Tomato therapy, if you will. First of all, there are story-line problems, the creep factor notwithstanding. The commercial clearly indicates that it is 8 o’clock and warns kids to knock. Then there is the tag line, “A long day of childhood calls for America’s favorite pasta sauce.” What kind of parents are feeding their kid dinner after 8 o’clock? (The kind who don’t lock the door, apparently.) The poor kid is stumbling around, racked by hunger, looking for his absent parents who are too busy addressing their own needs to provide for their offspring. True the kid didn’t look as though he’d ever missed a meal, but still, it doesn’t add up. Secondly to make it all better, there is pasta? Who could really think about food after that? Lastly, I really don’t know what the marketing team was going for here, but I’ll tell you what I got out of it. I can’t walk through the marinara section without associating their product with ejaculate. I’m just guessing that wasn’t part of the pitch. This entry was posted in Strange but True and tagged coitus interruptus, disturbing commercials, pasta sauce, ragu commercial by blmilhizer. Bookmark the permalink. I already know too much from your post, and am going to wisely do what I rarely do: NOT view the video of the commercial. There are too many “things that cannot be unseen” stuck in my cranium as it is. You may have saved my sanity. Or at least slightly delayed my descent into utter madness one day. “The kid didn’t look like he ever missed a meal.” That wasn’t necessary. You need help, if you think fat shaming children is okay. Oh, there is so much more to object to in this post than that. And furthermore, it’s shaming the parents who apparently allow their child too much time on the gameboy he’s carrying in the commercial while they are otherwise occupied and then offer comfort in carbs. Yet again, just another wonderful reminder of why I am so darn-tooting happy to not be living in the States. In Peru, via ESPN-LatinAmerica, I was able to watch the entire 3-hour Closing Ceremonies without a single commerical interrupution. No RAGU, no NBC – just Madness and Annie and ERIC-freaking-IDLE and Kaiser Chiefs (who?) and The Who. Yeah me!